Turns out, my kid freaking loved the headband. WTF?! Hates it every other bloody time, except this time! The headband is super light, and stretchy. I would imagine she hardly felt it on there at all. AND it was beautiful. My 3 year old called herself “Princess Lola” (that’s not her name BTW HAHA), she felt so beautiful. The hair ties came in a set of 3, and are also very light and stretchy. The material is wide, so as to not tangle the child’s hair in it. My daughter still protested when I tied her hair up *sigh* but she actually didn’t mind it being in there. When I pulled it out, it didn’t catch on any hair and pull her head, which is a total bonus. Belle Bands threw in an extra set of adult hair ties, for me to try. Now this in itself is an interesting exercise as I have a ginormous amount of hair. The hair ties (exactly the same material as the kids’ ones, just a bit longer) were stronger than I anticipated, and held my hair really well. I’m still wearing it an hour later and my hair hasn’t budged one bit. These are well worth it if your kid is anything like mine, and if they’re not – LUCKY YOU! Beautifully designed and assembled, I would definitely recommend them to other parents. The fact that these are hand made, and ordered to your specification, also means you can choose exactly the design and pattern – meaning you don’t receive anything that is unwanted. 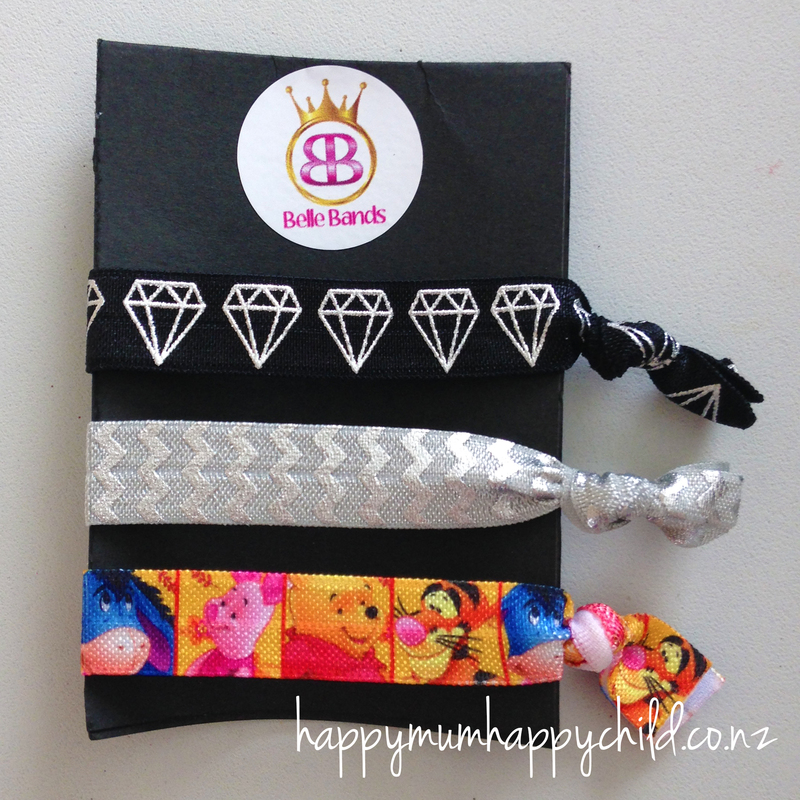 The hair ties also seem great for all hair types – my daughter has thin, fine hair, whereas I have thick, wavy hair. 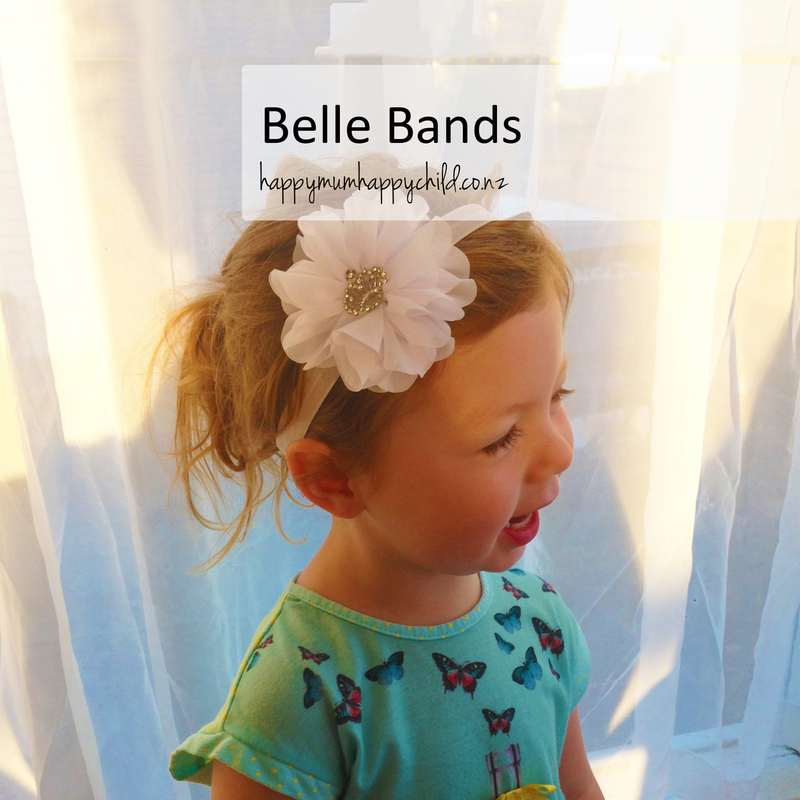 Belle Bands is a Facebook based business, and as such, all orders need to be placed through there. A set of 3 hair ties range from $4-$5 depending on the size, and the headbands range from $8-$14, also depending on the size.